Summertime is high season for bug bites and itchy rashes. Chiggers, also called harvest mites and red bugs, are particularly small arachnids that leave an annoying rash that can easily become infected. Despite chigger lore, chiggers do not carry diseases nor do they burrow under the skin. In fact, according to research entomologist Ludek Zurek, mistaken notions on these pesky little six-legged mite larvae can actually make chigger-related problems worse. Here is the itchy truth about common chigger myths and tips to avoid and treat chigger bites. America. However, chigger bites can become infected. “Chiggers simply use their piercing mouthparts to inject their host with a kind of spit. 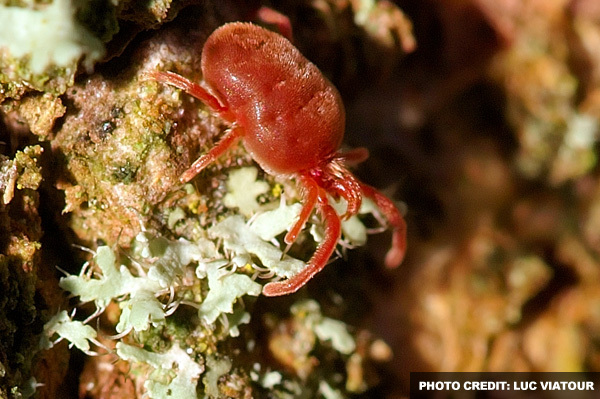 Their digestive juices are able to turn skin cells´ content into chigger food,” explains Zurek. The notion that chiggers burrow into the skin has given rise to “treating” bites with clear nail polish or washing a rash with harsh chemicals, such as bleach, to suffocate the bugs. oil on the bites to ease itching until you can get to the drugstore, if you don’t have Caladryl on hand. they are dislodged because they only have a one-use hypodermic ability at this stage. Multiple bites are typically due to a large group of chiggers. instructions carefully for best results. chiggers can also kill bug-eating spiders. Additionally, chemical chigger controls are not a long-term solution. Cut the lawn at its lowest (shortest) recommended height, so sunlight can reach the ground. Decrease suitable chigger habitats by weeding and removing piles and debris that can harbor the small animals that also serve as chigger hosts. Prune trees and shrubs to allow in more sunlight and moving air. Provide walkways and other entertainment areas that have no turf or other plants. time the bite gets scratched. When exposed to air, however, this oozy fluid will soon solidify into a hard “cap” — a distinct feature of chigger-caused feeding wounds. Chiggers seem to know the most annoying places to bite. According to Zurek, chiggers often roam, looking for a pore, hair follicle or other eating spot where the host´s skin is fairly thin. crotch and armpits, at shoe and sock tops, inside tight-fitting underwear, and under a waistband or belt. chiggers inside on clothing and forget to put that clothing immediately into the washer with soap and hot water. Any chiggers that haven’t latched on to a host will continue to roam for one. and private funds, the program has county Extension offices, experiment fields, area Extension offices and research centers statewide. Its headquarters is on the K-State campus in Manhattan.